Tooway supply a short length of earth cable to connect the TRIA to the dish assembly.� The customer in turn supplies their own earth cable to connect the dish assembly to ground. 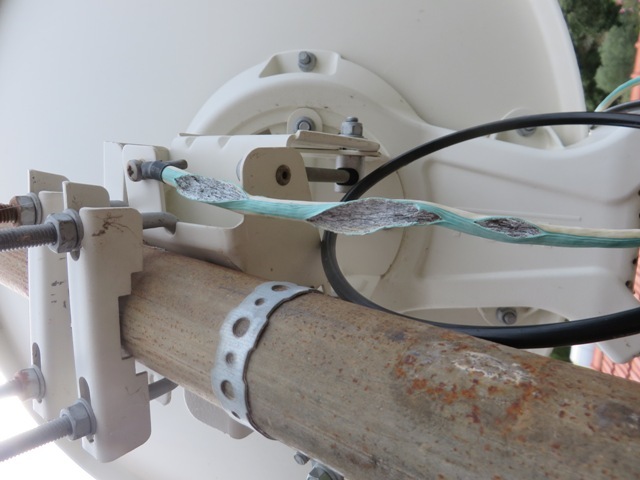 After three years, the dish-to-ground connection in my installation is in good condition.� The TRIA-to-dish connection has completely disintegrated at the point where it attaches to the TRIA. I only happened to notice it by chance.� Heaven knows how long I have been operating the link without any earthing at the TRIA. Stripping back the tooway-supplied cable, the left hand snapshot attached shows how the copper strands have become powdery.� This is for a considerable length, up to one metre. The right hand snapshot shows the remains of its original attachment to the TRIA, along with a replacement cable which I have now added. It happened me hundreds of times. Even in my house. In remote locations where I have one years with out coming back sure is disintegrated also. The white powder inside the Tooway supplied earthing cable is probably intentional. See if exists all along inside. It is probably chalk powder, talcum powder,� soapstone powder or an isocyanate compound powder whose purpose is to lubricate the wires so they slide within the sheath and relative to each other when the cable is flexed. Powders may cause asthma and other lung problems, as well as irritation of the eyes, nose, throat, and skin, so take care. Regarding breakage of the earth cable I suspect that the crimp is excessively tight. Are the tips of the wires pointed where they have been squeezed? The reason for providing the earthing wire may be to comply with some regulation.� There are safety considerations with regards to lightning hazards and electric shock. With regard to the operation of the Tooway TRIA it is the coax cable that matters. The connections of the copper centre pin and copper braid/sheath are critical. Note that duplicating the coax braid path by adding external earth cables creates complex routes for DC current flows and external induced currents.� If you have a property with protective multiple earthing (PME) be aware that adding any real earth to the ground may provide a path to ground for the entire house or neighbourhood AC mains return in the event of neutral fault in the mains network. Taking advice from a local qualified electrician is the best I can suggest.